White midnight, the endless Midsummer Night of the far north. Malyuta, a slave and hunter stands on watch over his new-born son. Then comes Kuzma, the bear shaman, and demands the baby for his apprentice. Thwarted, the bear-shaman takes his revenge on a family of reindeer-people. When they, too, refuse him a child, he curses them with ‘everlasting change.’ By day they will have their own shapes; by night, they will be wolves. In the far north, the night is six months long. Malyuta, the hunter, struggling to raise his adored child, slowly learns that the bear-shaman is still with them, walking in the boy’s dreams… And soon Kuzma demands that the boy fulfil his destiny by becoming a shaman – even if it means leaving all that he knows and loves. After many lonely years as a slave who hunts and traps fur for the czar through the long frozen months of the northern winter darkness, Malyuta, the hunter, is awaiting with his wife the birth of a child. Coming across a sable in one of his traps, he dreams of a son with ‘cheeks red as blood, skin white as snow, hair black as sable.’ The birth of his son is for Malyuta a miracle, giving him all he ever wanted from life. When a powerful shaman appears on the day of the birth, claiming that this child is his apprentice, born to be a shaman and, like him, to live three hundred years, Malyuta refuses to give up the baby. He swears that he will ‘be a roof to him, a fire for him, a dog to guard him, a wall against the night.’ He names the child ‘Ambrosi’ which means ‘immortal’ and cherishes him just as he has promised, but he cannot protect his son from the dreams the shaman sends in which he gives the boy magical powers. In a parallel story, the shaman visits a camp of Lapp people, where he demands a baby to take the place of the apprentice he has been denied. When their young leader, Bitten-by-a-Fox, refuses, the shaman puts a spell on the tribe. In winter they will be wolves’; in the light of summer they will return to their human form. The curse can only be lifted when Ambrosi agrees to enter the Ghost World and become the shaman’s apprentice. Unable to care for their young or hunt effectively, the wolf people die off, until Bitten-by-a-Fox is driven to accept the shaman’s conditions. His wolf-pack will kill Malyuta, now grown old, while Fox leads Ambrosi to the Ghost World. In a final act of defiance, however, Ambrosi cheats the shaman of his apprentice by choosing death. The beauty of the descriptive language of this tragic tale adds to the folkloric quality of the story – which incorporated the Norse myth of the death of Balder – leaving a haunting memory for the reader. Life is a sequence of choices and consequences. In Ghost Drum, a slave woman chooses to give up her baby daughter to a shaman so that the child could live free. In this companion novel, [Ghost Song] a young father, faced with the same choice, refuses to give up his new born son. The offended shaman, Kuzma, the only character to carry over from the first book, vows revenge and so a tragic sequence of events is set in motion. Kuzma’s anger is directed not only at Malyuta and his son Ambrosi, but also at a nomadic tribe who follow the reindeer. This tribe is visited by Kuzma, and although they welcome him and treat him with respect, he curses them and changes them into werewolves. To break the spell and save the tribe, one of them must serve Kuzma and help him to steal Ambrosi away from his fiercely protective father. Like the previous book, this one has the feel and flavour of old folktales, specifically those from northern Europe. There is a purity and a beauty to the language: every word, every phrase, is perfectly placed, like an exquisite ice sculpture. 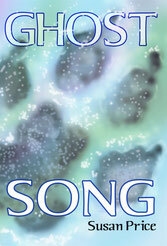 This is a must for libraries that own Ghost Drum, and even for those who don’t. Susan M Harding, Mesquite Public Library.